This is an image of Bea when she was ninety-one. She is small and contained, holding herself upright and together with tremendous dignity. She was famous in our community because she was working in the Home Office when Chamberlain returned home with his piece of paper offering 'peace in our time'. She had lived history. She was loving and encouraging to me, a great enabler and giver of strength. This didn’t mean that she was not without problems herself. Regarding these she was authentic but also brave, as she was often in pain because of the vicissitudes of age. I told her about this project and asked her if she would agree to be part of it. She agreed, but she was not sure if she had anything to tell that was relevant to the theme of becoming a self. She believed rather that she had never been able to be her real self. She described the poverty of her childhood and how, as the oldest daughter, she had helped her beloved mother and siblings. She was especially intelligent and had a thirst for learning. Despite getting into the grammar school she was not able to continue her education. Her father was one of the two million unemployed and she needed to work. Dynamic and attractive, she could have married. She then renounced that in favour of buying a house to share with her ailing mother and her sister who meant so much to her. Although she rose to a very respectable level in her profession, she also met sexism from a boss who couldn’t bear women. Lonely and exhausted she had a kind of breakdown which led to a different kind of life. She ran a bed and breakfast for a while. In this endeavour she shared the house with her sister who found her vocation there as an inspirational headmistress. Eventually, however, Bea returned to her original profession. Because of the break, she had to enter it at a lower level than her experience deserved. During this time her search for meaning resulted in a deep and rich connection to a church called The Christian Community. This remained a lodestar and rock in her life. When I first met Bea, she was retired and I only gradually got to know her. 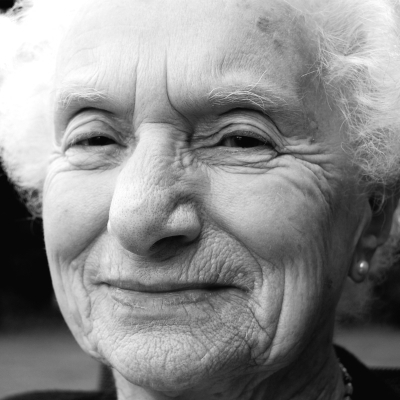 To everyone she met she was an example of what it means to achieve dignity as a older person. Everyone who knew her admired and respected her. They also were touched by her loving interest. She, on the other hand, saw her life as one where she had given up everything she had ever wanted to do either because of necessity or because of responsibilities. When I told her that her generous demeanour gave no sign of ever having been thwarted, she said she believed it was important to do the right thing and to be positive. I asked, 'Do you know how we all admire and love you, do you know what a success you have made of your life?’ She just looked surprised and laughed and said, ‘I have just never thought of it like that darling.’ She had, it is true, been dutiful; however, she had been so wholeheartedly giving and genuine that she had nevertheless really become someone.